London, UK. 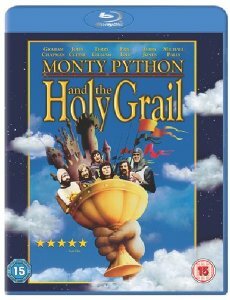 14/02/2012 - From the fertile minds of the 20th Century's most brilliant and outrageous comedy troupe comes their most highly regarded comedy classic - Monty Python and the Holy Grail - debuting on Blu-ray™ March 26 from Sony Pictures Home Entertainment. Their second feature film stars Graham Chapman, John Cleese, Eric Idle, Terry Gilliam, Terry Jones, and Michael Palin as we follow King Arthur and his knights in their search for the Holy Grail. Encounter the Black Knight, the Killer Rabbit, The Knights Who Say 'Ni'! and the Black Beast of Aaaargh! The Blu-ray set is brimming with coconuts, shrubberies and swallows (African or European), OOPS, we mean loads of bonus materials, including over thirty minutes of new Blu-ray exclusive special features. This medieval madness will be available on Blu-ray for £19.99. Monty Python and the Holy Grail has a running time of 92 minutesand is rated 15.